After an exciting weekend, we are officially down to four teams left in the NCAA Tournament. Virginia, Michigan State, Texas Tech, and Auburn all took down challenging opponents in close games in the Elite Eight, securing their spots in the Final Four. Last week, Cats Stats posted on article looking at the Sweet 16 via the Efficiency Landscape, which was based on the following tweet by Kirk Goldsberry looking at the efficiency landscape of the NBA. Similar to the visualization in last week’s article , the new graph displays the pre-tournament KenPom rankings of all 68 teams in this year’s NCAA Tournament field based on their adjusted efficiency. 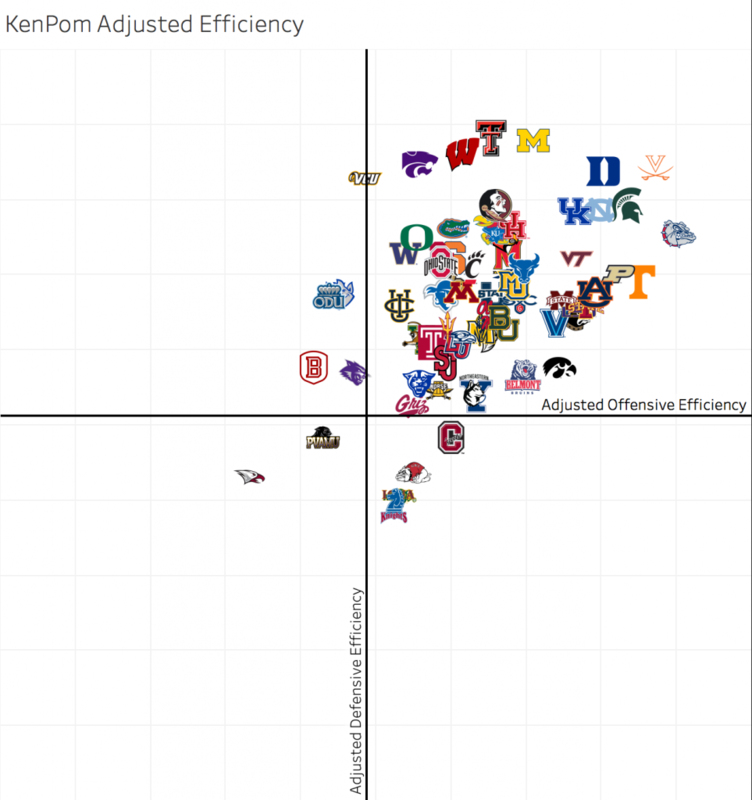 As you can see, most of the teams are located in the top right quadrant of the graph, indicating that they had above-average adjusted offensive and defensive efficiency. The teams whose adjusted efficiency margin has increased the most since the start of the tournament include Texas Tech, Oregon, UCF, Houston, and Auburn. The teams whose adjusted efficiency margin has decreased the most since the start of the tournament are Marquette, Wisconsin, Louisville, UNC, and—surprisingly—Virginia. At the beginning of the tournament, Virginia ranked 1st in KenPom’s adjusted efficiency margin, ranking 2nd in adjusted offensive efficiency and 5th in adjusted defensive efficiency. Despite dropping down in the adjusted efficiency margin metric (from 35.66 to 34.23), Virginia still remains well ahead of the competition and has retained their #1 overall ranking. They have the same adjusted offensive and defensive efficiency rankings as well. In other words, despite some close games against inferior teams (e.g. Oregon), the Cavaliers remain KenPom’s favorite to win it all. Michigan State began the tournament ranked 4th in KenPom’s adjusted efficiency metric, ranking 4th on the offensive side of the ball and 8th on the defensive side of the ball. As a 2 seed, they were actually ranked ahead of 1 seed UNC in adjusted efficiency. The Spartans’ status has hardly changed since then—their adjusted efficiency margin increased from 31.36 to 31.50—but they have surpassed Duke after defeating them and moved up to 3rd in KenPom’s rankings. As indicated above, Texas Tech has been a significant riser during the NCAA Tournament, increasing their adjusted efficiency margin from 26.75 to 29.53. They have also moved up from 9th to 5th in KenPom’s rankings. The Red Raiders have improved on both sides of the ball, improving their adjusted offensive efficiency ranking from 36th to 30th and improving their already dominant defense, maintaining their status as KenPom’s highest ranked defensive team. Auburn has been another significant riser during the tournament, as they increased their adjusted efficiency margin from 23.33 to 24.70. Their strong offense has improved even further, moving from 8th to 6th in adjusted offensive efficiency, while their defense has not changed significantly since the beginning of the tournament. With a Virginia offense that ranks 2nd in adjusted offensive efficiency, the Tigers’ defense (currently ranked 38th in adjusted efficiency) will surely be tested. All in all, the Final Four produced four outstanding teams, with none of them ranked below 13th in KenPom’s pre-tournament evaluations. Looking ahead to the next round of games on Saturday, KenPom gives Virginia a 70% chance to win their matchup against Auburn, while Michigan State has a 55% chance of taking down Texas Tech. One can only hope that those games will be as thrilling as this weekend’s Elite Eight games.